Background Existing evaluative instruments for dysphagia, odynophagia, and voice disturbance are cumbersome, focus pre-dominately on dysphagia, and often require administration by a certified Speech Pathologist. This study was conducted to utilize widely accepted instruments such as the American Speech and Hearing Association's National Outcomes Measurement System (NOMS) and VAS pain scales to validate a novel, patient-reported instrument that quantifies the severity of post-operative dysphagia, odynophagia, and voice disabilities (DOV). Methods The DOV was developed and subjected to multiple rounds of face and content validation by representative patient cohorts and a panel of clinical experts. An established, prospective clinical registry was utilized to collect pre and post-operative VAS-swallow related pain and DOV measurements for subjects with recent anterior cervical procedures (n=25 content validation, n=20 criterion validation), or recent lumbar decompressions (n=33). NOMS evaluations were performed by a certified Speech Language Pathologist on the first post-operative day after minimally invasive anterior approaches to cervical reconstruction were performed in the criterion validation cohort. Results Content validity: Subjects with a recent anterior cervical procedure reported a significant increase in post-operative dysphagia (pre-op: 0.13±0.35, post-op: 1.08±1.41, p=0.01), odynophagia (pre-op: 0.24±0.69, post-op: 0.84±0.90, p=0.001), and voice (pre-op: 0.10±0.41, post-op: 0.88±0.92, p=0.0004) disturbance. In contrast, subjects with a recent lumbar procedure did not demonstrate a significant increase in post-operative dysphagia, odynophagia, or voice disturbance (p>0.05). Criterion validity: Chi-squared contingency testing for independence between converted NOMS and DOV instrument scores accepted linkage between the two instruments for dysphagia X2(DF: 12, n=20, Expected: 21.03, Observed: 24.4, p: 0.02) and voice X2(DF: 6, n=20, Expected: 12.60, Observed: 21.28, p: 0.002) dimensions. Similarly, converted swallow related VAS and DOV odynophagia instruments demonstrated linkage X2(DF: 9, n=20, Expected: 16.92, Observed: 24.21, p: 0.004). Internal Reliability: Chronbach's alpha coefficient of reliability was 0.74 between all DOV survey dimensions. Conclusions The DOV survey is a valid patient-reported instrument to rapidly and reliably detect post-operative swallow and voice dysfunction. Prevertebral soft tissue swelling (PSTS) is a common post-operative radiographic finding associated with anterior cervical operative approaches (Figure 1).1-4 Post-operative prevertebral swelling has been reported to result in severe airway compromise in up to 5-6% of all anterior cervical procedures and in rare cases may require emergent intubation or tracheostomy.2,4-10 Various modifications have been proposed to decrease post-operative morbidities after anterior approaches to the cervical spine, including implantation of zero-profile cervical interbody spacer systems and the intraoperative deposition of retropharyngeal steroids.11-13 Nevertheless, there remains a dearth of patient reported outcomes to support the use of these technologies in the current clinical setting. An example of prevertebral soft tissue swelling after an anterior approach to cervical fusion. Such swelling can lead to dysphagia, odynophagia, or voice changes. Existing evaluative instruments such as the American Speech and Hearing Association's National Outcomes Measurement System (NOMS) are burdensome and require administration by a highly trained practitioner.14 Although this instrument is a validated and reliable method to screen for dysphagia or voice disturbance, it is not typically feasible to obtain a complete post-operative NOMS assessment on every patient after an anterior cervical approach. As a result, cases of mild to moderate post-operative disability that would benefit from an advanced dysphagia or voice dysfunction workup may be overlooked. 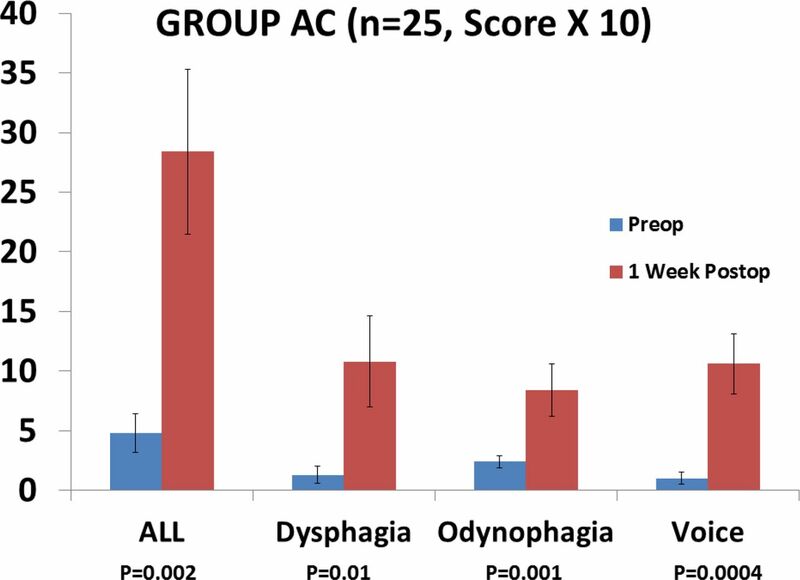 This study was conducted to construct and validate a novel, patient-reported survey to quantify the severity of post-operative dysphagia, odynophagia and voice disturbance (DOV). The DOV was designed to function as a sensitive screening instrument that could rapidly and reliably detect post-operative swallow and voice dysfunction without overburdening health-care resources. Validation of the DOV was accomplished in four phases: (1) Initial face validity was established by a panel of experts as well as a population of patients with self-reported swallow dysfunction, (2) content validity was assessed through distribution of the DOV to subgroups at high and low risk of swallow dysfunction, (3) criterion validity was established through utilization of widely accepted and previously validated practitioner-administered outcome instruments (NOMS-Swallow, NOMS-Voice, VAS of swallow related pain) to validate the DOV survey, (4) internal reliability of the DOV survey was evaluated utilizing Chronbach's alpha statistical analysis. DOV questionnaires (Figure 2) were comprised of 3 distinct categories of disability: dysphagia (4 points), odynophagia (3 points), and voice (3 points). A multi-specialty panel of experts (Speech Language Pathology (DR), Otolaryngology (BW), Orthopaedic Spine Surgery (CWK), and Physical Medicine and Rehabilitation (JAS)) evaluated the DOV questionnaire for overall appearance, relevance and representation of its elements. The patient administered Dysphagia, Odynophagia, and Voice (DOV) survey. The DOV questionnaire was then administered to a cohort of patients with a recent anterior cervical procedure for further face validation by a representative sample of individuals with swallow dysfunction. Patient-modified surveys were redistributed to the expert panel to reassess both accuracy and the connection among asked questions and measured variables prior to proceeding with criterion validation. After face validity was achieved, the DOV was administered preoperatively, and at one week post-op to two distinct patient subgroups for content validation. 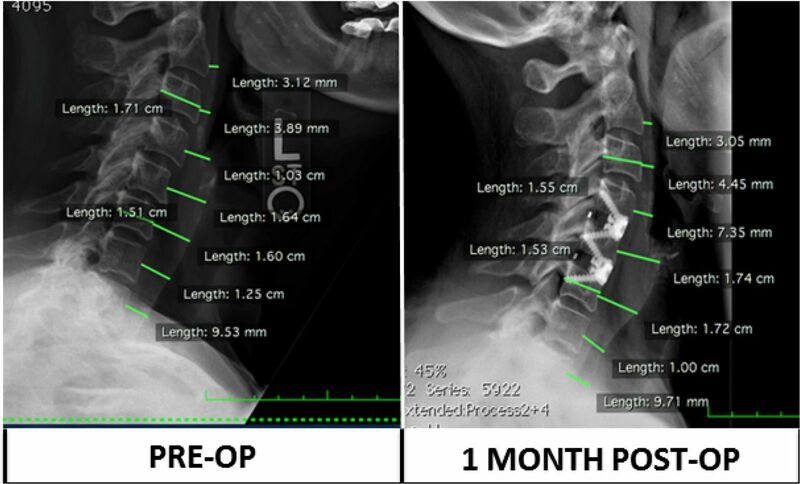 The first group (Group AC), underwent an anterior cervical procedure and represented a patient subgroup at high risk for post-operative DOV disability. The second group (Group LD) underwent a lumbar decompression procedure and was representative of a subgroup with recent intubation that was otherwise at low risk for DOV disability. Analysis was performed on dysphagia and voice components of the DOV questionnaire and compared to the NOMS swallow and voice disability ratings assigned by the treating Speech Language Pathologist. NOMS dysphagia and voice scores were converted to an equivalent DOV score based on comparable functional disability (eg. A NOMS category that recommends an NPO diet was converted to a DOV disability score that describes incapability of swallowing all textures and consistencies). Odynophagia was evaluated through a comparison of swallow-related VAS (VAS-SR) pain and the odynophagia dimension of the DOV survey. VAS-SR pain scores were converted to an equivalent DOV-Odynophagia severity score prior to criterion validity analysis (Table 1, Figure 3). Cervical patients (AC) reported a significant increase in post-operative dysphagia, odynophagia, and voice disability. 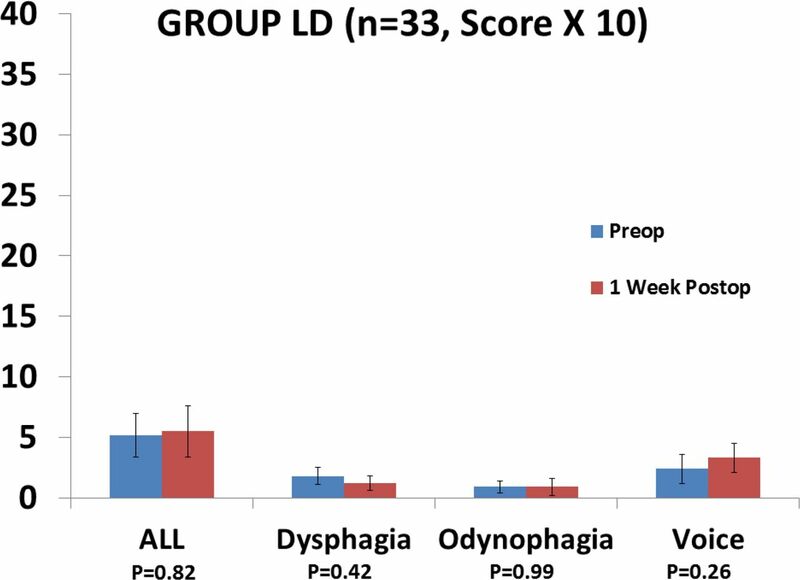 Statistical analysis for content validity utilized unpaired t-tests to compare one-week post-operative dysphagia, odynophagia and voice disability scores between group AC and group LD. Significance was defined as p<0.05. Criterion validity was achieved utilizing convergent analyses between converted NOMS swallow and voice disability scores and DOV dysphagia and voice scores, respectively. Additional convergent analysis was conducted between DOV odynophagia dimension and VAS-SR pain scores. A null hypothesis of independence between instruments was stated for each convergent analysis (p<0.05 represents equivalence between the two instruments). Reliability was assessed with Chronbach's alpha test of internal reliability. A minimum Chronbach's alpha coefficient of 0.7 was considered satisfactory for group-level comparisons, which is consistent with historically accepted values.18 All statistical analyses were completed using the XLSTAT package for Excel and the Wessa Chronbach's alpha calculator.19 Values are reported as mean ± standard deviation, unless otherwise stated. The non-cervical group (LD) did not demonstrate a significant increase in post-operative dysphagia (p=0.21), odynophagia (p=0.5), or voice (p=0.13) disability. A total of 20 literate, primary English speaking adult subjects (13 female: 7 male, Age: 62.7±13.5 years) completed DOV, NOMS, and VAS-SR instruments on post-operative day one after a minimally invasive anterior cervical discectomy and fusion with a zero profile interbody spacer (single-level: n=4, two-level: n=12, two-level with single level corpectomy: n=1, three-level: n=2, four-level: n=1). Overall, summated DOV scores for the cohort were 3.1±2.4 (dysphagia subscale 0.95±1.2, odynophagia subscale 1±0.80, voice subscale 1.2±0.9, Figure 5). Overall, summated converted scores for the NOMS and VAS instruments were 3.2±2.1 (NOMS swallow dysfunction subscale 1.1±1.2, VAS-SR subscale 1.1±0.89, NOMS voice dysfunction subscale 1.0±0.56, Figure 6). Chi-squared contingency testing for independence between converted NOMS swallow and DOV dysphagia dimensions accepted the alternative hypothesis of linkage between the two instruments X2(DF:12, n=20, Expected: 21.03, Observed: 24.4, p: 0.02). Contingency testing for independence between converted NOMS voice and DOV voice dimensions also rejected inter-survey independence and accepted linkage between the instruments X2(DF: 6, n=20, Expected: 12.60, Observed: 21.28, p: 0.002). Similarly, Chi-squared testing for independence between converted VAS-SR and DOV odynophagia dimensions accepted inter-survey linkage X2(DF: 9, n=20, Expected: 16.92, Observed: 24.21, p: 0.004). 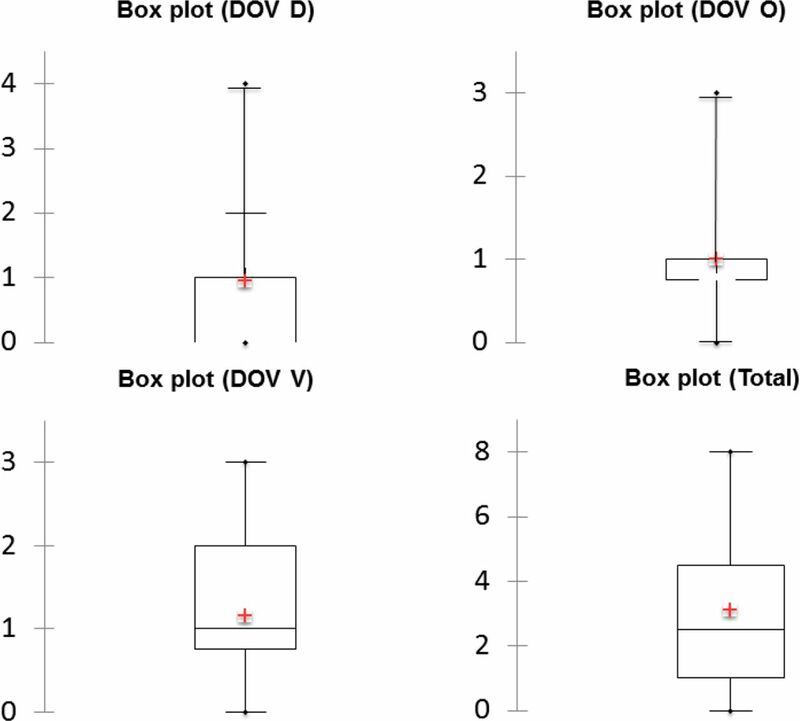 Box and whisker plot depicting the score distribution of each DOV subscale. Mean value represented by (+), the box represents quartiles 1 through 3 intersected by the median value. Whiskers represent the maximum and minimum data points. 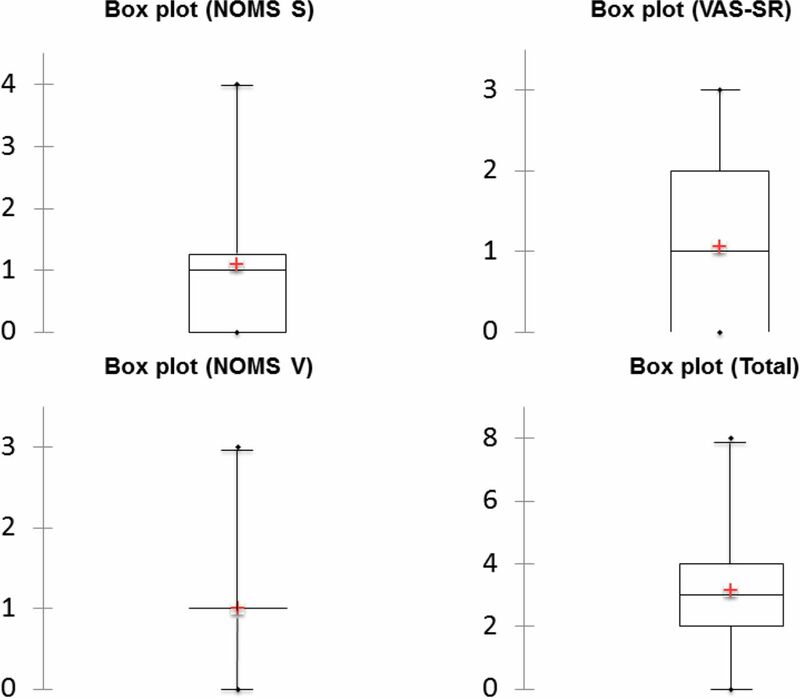 Box and whisker plot depicting the score distribution of each NOMS subscale. Mean value represented by (+), the box represents quartiles 1 through 3 intersected by the median value. Whiskers represent the maximum and minimum data points. NOMS V mean, median, quartile 1, and quartile 3 values were all 1, which is representative of a minimal to min-moderate limitation. Internal reliability between all dimensions of the DOV instrument was calculated to be acceptable (Chronbach's alpha reliability coefficient: 0.74). The reliability coefficient between dysphagia and voice subscales was 0.81, the coefficient between dysphagia and odynophagia was 0.58, and the coefficient between odynophagia and voice was 0.46 (Table 2). Chronbach’s Alpha Internal Reliability Values. This study utilized the widely accepted, NOMS and VAS-SR surveys to successfully validate the patient-reported DOV instrument. The DOV demonstrated acceptable face validity, content validity, criterion validity, and internal reliability when used to assess swallow and voice disabilities in a patient population with recent anterior prevertebral soft tissue disruption. Anterior cervical procedures and their consequent PSTS are major contributors to post-operative dysphagia. However, to the best of our knowledge, it has not been directly correlated to post-operative odynophagia or voice disturbances.1,4,20 Our content validation cohort demonstrated significantly more disability in all tested domains in the anterior cervical surgery group compared to the lumbar surgery group, including swallow related pain and subjective voice disturbance. Irritation of the recurrent laryngeal nerve and the external branch of the superior laryngeal nerve are the most commonly described causes of vocal dysfunction after anterior cervical operative approaches. Yet, it has been reported that 50% of individuals with a unilateral recurrent laryngeal nerve palsy are clinically asymptomatic.21 Another proposed mechanism of post-operative vocal dysfunction is iatrogenic damage to the cervical strap muscles, leading to subtle changes in motility and tension properties of the internal and external laryngeal muscles during phonation.22 Early detection of patients with subjective voice disturbance by the DOV instrument would not only expedite treatment plans focused on vocal rehabilitation, but also facilitate investigation into the epidemiology of voice morbidities. Comprehensive evaluation of swallow dysfunction may be achieved with either a modified barium swallow (MBS) or Fiber-optic endoscopic examination of the swallow (FEES).29 Although both diagnostic procedures have been shown to identify appropriate dietary consistencies and detect signs of dysphagia (laryngeal penetration, aspiration, pharyngeal residue), FEES is also able to visualize pathophysiologic causes of dysphonia and odynophagia.29-31 However, selection of the appropriate examination is often clinically difficult given the largely congruent set of indications between the MBS and FEES assessments. Implementation of the DOV as a screening tool to rapidly detect individuals at the highest risk for clinical aspiration, both with and without dysphonia or odynophagia, would facilitate selection of the appropriate diagnostic modality. A limitation of this study is the small and relatively homogenous sample of patients used for criterion validation. Although the DOV was designed to detect postoperative swallow and voice disability after multiple types of anterior cervical approaches, all subjects were from a single site and underwent an anterior cervical reconstruction with a zero profile interbody spacer system. Appraisal of the DOV in different post-operative settings would increase confidence in the generalizability of the results. (2011) Analysis of prevertebral soft-tissue swelling and dysphagia in multilevel anterior cervical discectomy and fusion with recombinant human bone morphogenetic protein-2 in patients at risk for pseudarthrosis: clinical article. Journal of Neurosurgery: Spine 14(2):244–9. (2006) Prevertebral soft tissue swelling after anterior cervical discectomy and fusion with plate fixation. International orthopaedics 30(4):290–4. (2002) Swallowing and speech dysfunction in patients undergoing anterior cervical discectomy and fusion: a prospective, objective preoperative and postoperative assessment. Journal of spinal disorders & techniques 15(5):362–8. (1997) Dysphagia following anterior cervical spine surgery. Dysphagia 12(1):2–8. (2007) Anterior cervical discectomy and fusion associated complications. Spine 32(21):2310–7. (2005) Dysphagia after anterior cervical decompression and fusion: prevalence and risk factors from a longitudinal cohort study (presented at the 2004 CSRS Meeting). Spine 30(22):2564–9. (2004) Prospective analysis of incidence and risk factors of dysphagia in spine surgery patients: comparison of anterior cervical, posterior cervical, and lumbar procedures. Spine 29(13):1441–6. (2002) Airway complications associated with surgery on the anterior cervical spine. SPINE-PHILADELPHIA-HARPER AND ROW PUBLISHERS THEN JB LIPPINCOTT COMPANY-27(9):949–53. (2001) Can airway complications following multilevel anterior cervical surgery be avoided? Journal of Neurosurgery: Spine 94(2):185–8. (1991) Upper-airway obstruction after multilevel cervical corpectomy for myelopathy. J Bone Joint Surg Am 73(4):544–51. (2015) Zero-profile anchored spacer reduces rate of dysphagia compared with ACDF with anterior plating. Clinical Spine Surgery 28(5):E284–E90. (2014) Comparative study of clinical and radiological outcomes of a zero-profile device concerning reduced postoperative Dysphagia after single level anterior cervical discectomy and fusion. Journal of Korean Neurosurgical Society 56(2):103–7. (2011) Effect of retropharyngeal steroid on prevertebral soft tissue swelling following anterior cervical discectomy and fusion: a prospective, randomized study. Spine 36(26):2286–92. (1998) National Outcomes Measurements System (NOMS): Adult Speech-Language Pathology Training Manual (American Speech-Language Hearing Association, Rockville (Maryland)). (1991) Performance tests in human psychopharmacology (2): content validity, criterion validity, and face validity. Human Psychopharmacology: Clinical and Experimental 6(2):91–8. (2014) Validation and analysis of a multi-site MIS Prospective Registry through sub-analysis of an MIS TLIF Subgroup. International journal of spine surgery 8(1):4. (2000) SF-36 health survey: manual and interpretation guide: Quality Metric Inc.
(2011) Cronbach alpha (v1. 0.1) in Free Statistics Software (v1. 1.23-r6) (Office for Research Development and Education [online]), https://www.wessa.net/rwasp_cronbach.wasp. (2012) Dysphagia and soft-tissue swelling after anterior cervical surgery: a radiographic analysis. The Spine Journal 12(8):639–44. (1974) Benign disease of the thyroid gland and vocal cord paralysis. The Laryngoscope 84(6):897–907. (1997) Phonatory characteristics of patients undergoing thyroidectomy without laryngeal nerve injury. Otolaryngology-Head and Neck Surgery 117(4):399–404. (2014) Anterior cervical discectomy and fusion with a zero-profile integrated plate and spacer device: a clinical and radiological study: clinical article. Journal of Neurosurgery: Spine 21(4):529–37. (2009) A new stand-alone cervical anterior interbody fusion device: biomechanical comparison with established anterior cervical fixation devices. Spine 34(2):156–60. (2005) Influence of anterior cervical plate design on dysphagia: a 2-year prospective longitudinal follow-up study. Journal of spinal disorders & techniques 18(5):406–9. (2006) Cricopharyngeal Botox injection: indications and technique. Current opinion in otolaryngology & head and neck surgery 14(6):431–6. (2009) Endoscopic CO2 laser cricopharyngeal myotomy. The Laryngoscope 119(1):45–53. (2003) Endoscopic staple diverticulostomy for Zenker's diverticulum: review of literature and experience in 159 consecutive cases. The Laryngoscope 113(6):957–65. (2013) The modified barium swallow and the functional endoscopic evaluation of swallowing. Otolaryngologic Clinics of North America 46(6):1009–22. (2003) Gold-standard? Analysis of the videofluoroscopic and fiberoptic endoscopic swallow examinations. J Applied Res 3(1):1–8. (1991) Endoscopic and videofluoroscopic evaluations of swallowing and aspiration. Annals of Otology, Rhinology & Laryngology 100(8):678–81.